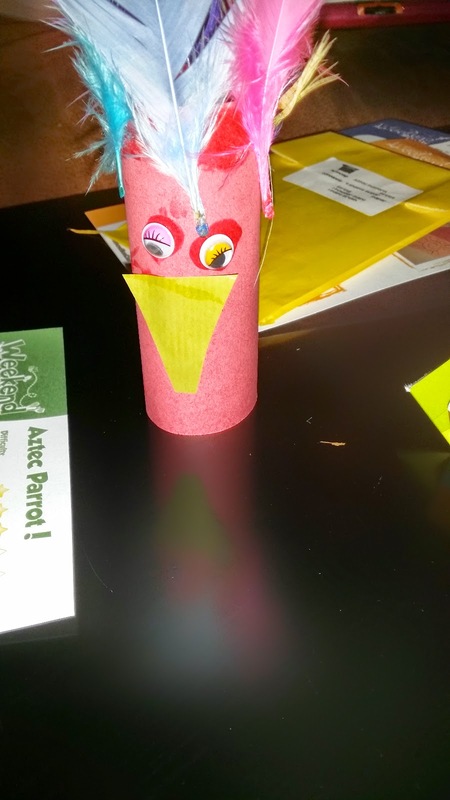 Check out my kids activity box posts! Its the start of another promising week and I cannot believe just how quick the weekend flew by. I mean, I love weekends, mine is almost always packed with a handful of activities but I guess that's expected being a mum of two kids( four years and 10 months respectively) . This weekend, I decided we should try something different. A couple of days ago, I had received a cute little box of surprise from The Weekend Box . It is packed full of fun, creative and exploratory activities to keep my four year old entertained and busy for a considerable period of time. Although we were both quite excited, hers was understandably more as she would not stop asking me when she would get to find out the contents of the box. Roll on Saturday and we finally opened the weekend box! First thing I noticed was that the content of our box was an Aztec themed one! So every activity in the box was centered around the Aztec theme. What fun way to play and learn! 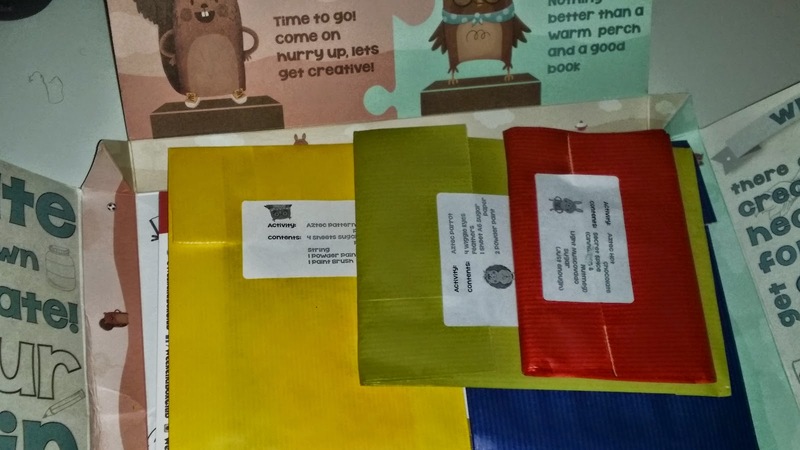 The box contains four color matching Aztec themed activity bags with the contents of each bag involving a bit of cooking, exploring and of course making stuff, how creative! . Each activity box includes an accompanying color matching instruction sheet and as I mentioned earlier, necessary materials needed to complete each task. 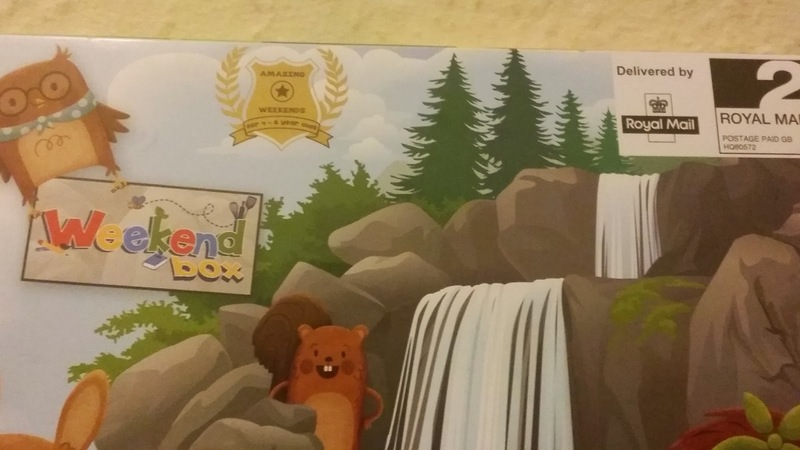 There are also accompanying reward stickers for each activity completed and a somewhat bigger ''Finished'' sticker to be awarded when all the tasks had finally been completed. I like that the box provides an opportunity to teach kids the importance of following through on tasks and being rewarded. 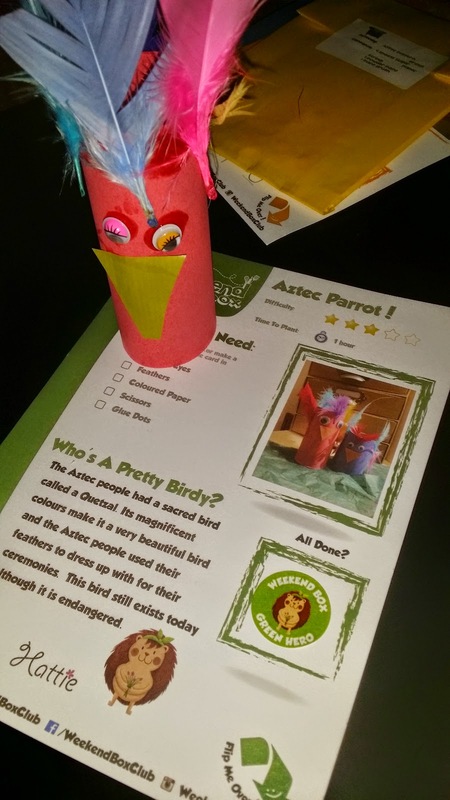 Green Activity with Hattie the Hedgehog- Aztec Parrot! My four year old and I made a colorful parrot while her younger sister looked on attentively. She was very eager to do this on her own but I reminded her Mr Maker(from Cbeebies) said Scissors is sharp so she gladly welcomed my help with cutting out the parrot's nose and also applying glue to get the parrot bits together. 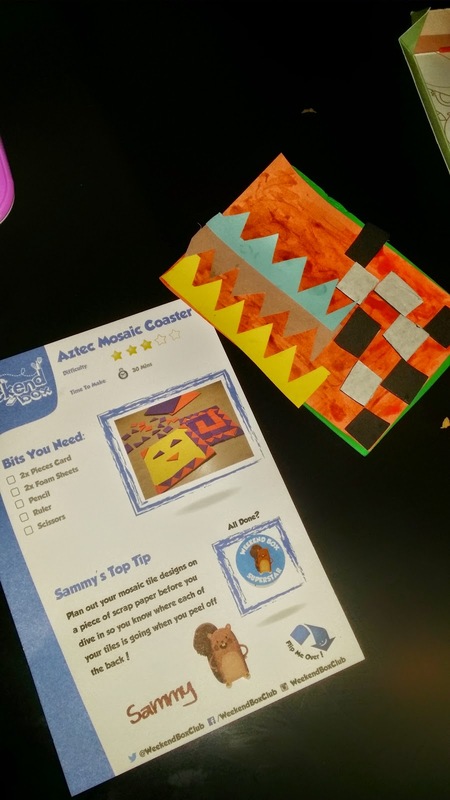 Blue Activity with Sammy the Squirrel- Aztec Mosaic Coaster! Sadly, I only went as far as cutting bits and pieces for this task. My little girl was very excited to try out the designs on the instruction sheet on her own. It might not look so Aztec but I am proud of what she's done. After all the aim is to get her creative and encourage her to use her sensory abilities more. Red Activity with Wooster the Rabbit- Aztec Hot Chocolate! This was quite fun to do. 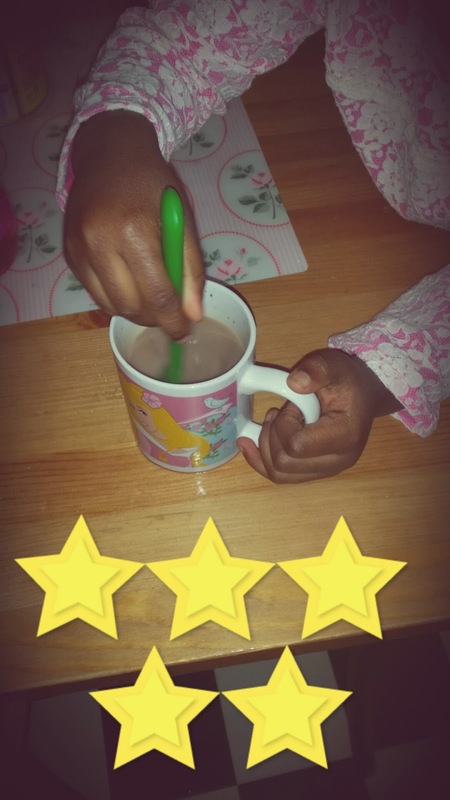 We simply made a cup of frothy hot chocolate using regular hot chocolate stuff and the special secret ingredient that came with the box for this purpose (You will need to get a box for your little one to find out what the secret ingredient is). It tasted really nice. Yellow Activity with Oswald the Owl-Aztec Pattern Prints! After much convincing, my daughter agreed we save this last activity for next weekend but I kind of tried this out visually in my head and I think this will be the most fun of all the tasks due to the amount of creativity involved. My daughter, absolutely enjoyed completing each task. As a parent, the weekend activity box seems like an answer to thoughts of what to do on days when we have had to stay indoors perhaps due to unfriendly weather or other reasons. In the same vein, no longer do I also have to worry about ''what other thing'' to take along for a visit to the park with the kids, the weekend box is sure to come to the rescue. We obviously would not be cooking in the park but we can make more themed animals, get creative and explore! My daughter,has told me she is looking forward to telling her friend's in school about her new parrot she made over the weekend. 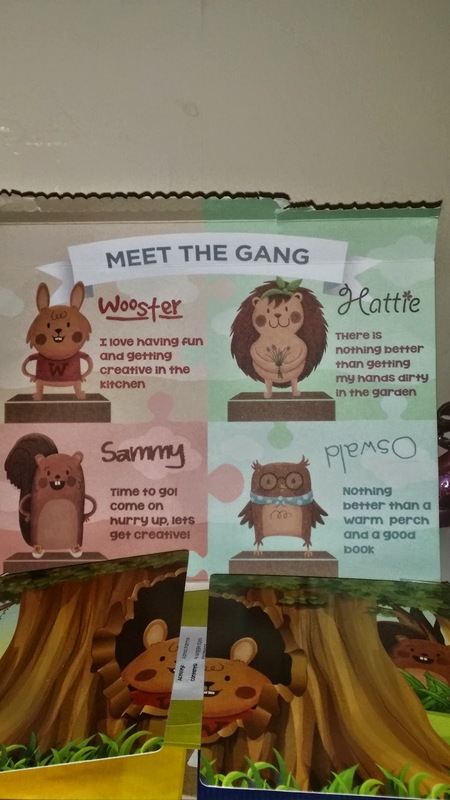 The weekend box would be great as a gift for kids between the age range of 3-6 years. Compactly sized so it fits through letter boxes with ease, It comes at a decent and pocket friendly price and it gets delivered fortnightly and monthly so this is something to consider if you would perhaps prefer regular subscription..
Would you like to try the weekend box too? The very lovely team at Weekend box are giving you the opportunity to get your hands on one of these boxes at no cost to you. Yes! you get your first box free. Do let me know how you get on with the box. I hope you enjoy the activities with your little ones. As for me and my little girl, we look forward to completing the last activity which is the Aztec pattern prints next weekend. Complimentary Weekend box was received for review purposes. Unless otherwise stated, views,opinions and pictures are my own.